For those beginning to learn Arabic, here is an awesome drill that should be part of your daily Arabic study: the detached pronouns. 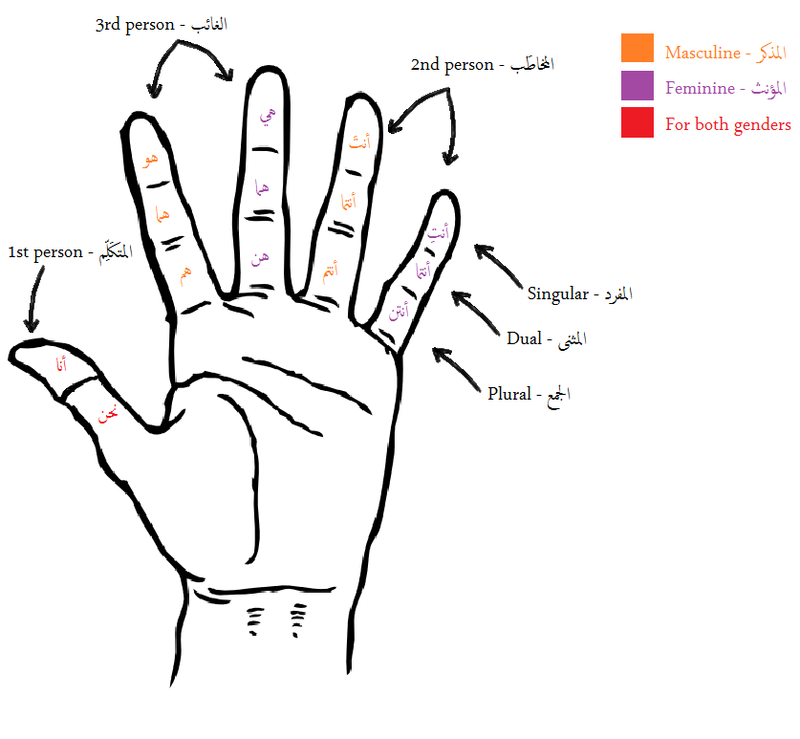 There are 14 detached pronouns and its a great idea to have them memorize like the back of your hand. Yes, indeed. Sing this song a few times and the pronouns are stuck to your head 🙂 The song is composed and sung by our beloved teacher Asif Meherali of LQToronto.com. Check out the LQToronto.com Arabic Language course (based on the world renowed Madinah Books of Dr. V Abdur Rahim) if you want to seriously learn Arabic. I think its the best way to learn Arabic (for a non-Arab). This entry was posted in Arabic, Islam and tagged Arabic, Islam, Life. Bookmark the permalink. Salam brother. You have listed the detached pronouns (damaa’ir munfasila), and so they should have detached pronoun meanings in English. As such, you should say ‘they’ not ‘them’ and ‘they two’ not ‘them two’ for all the mukhaatab pronouns. When they are attached (muttasil), they will have the meanings you gave them. Please do not take offence by this gentle reminder. Jazaak Allah khair. Salam again. The same comment goes for ana, nahnu and hiya. ‘Me’ should be ‘I’, ‘us’ should be ‘we’ and ‘her’ should be ‘she’. We say: “I am sick” not “Me is sick”, “She is my sister” not “Her is my sister”, etc. If you can make a table with the correct translations, please let me know. Thanks for the song and the hand chart! I struggled all last semester with memorizing the pronouns, but I think this will help so much! Is there a way to download the song as an mp3 so I can listen to it on my mp3 player throughout the day? I have understood the 14 madi detached pronouns, huwa, huma, hum etc… and they are singular, dual and plural. What I don’t understand is damir(singular) and damaair(plural). Are these different than the above forms. Please explain as much as possible as I am a beginner. Pingback: Class of Tues. 2/9/10 « "An Arabic Qur'an"
I wanted to suggest that for the 2nd hand, that the color coding be: blue for male, pink/red for female, and purple for dual/both. On this section while learning “Arabic with Husna” with Nouman Ali Khan http://bayyinah.tv I cant rate it highly enough. If you don’t like my voice, then make your own and share it. It is a great way aid learning.